Not to be confused with Jean-Claude Van Damme, the “Muscles from Brussels,” this dish is so yummy and seemingly sophisticated that you’ll be surprised that you can put the meal together faster than Jean-Claude can do 20 pushups. OK, perhaps not that fast, but the entire dish cooks in about 30 minutes. Now for the mise en place: Rinse Brussels sprouts, slice off just the bottom of each vegetable and then halve or quarter them. Place in mixing bowl, sprinkle with cooking oil and salt, then toss. If roasting, set oven to 400. Sprinkle pan with a little more oil, spread sprouts on one layer on the sheet, and bake for 20 minutes. Check the pan and roast until sprouts are brown and soft. If sautéing, heat a nonstick pan to medium, add a dash of oil and then sprouts. We added mushrooms into the mix as well. Move them around every few minutes until browned and to desired softness. For serving size, figure about one cup of sprouts per person. While the sprouts are doin’ their thing, remove beards from mussels as you rinse them. (We got a two-pound bag of mussels for just $5 at Wegman’s; that’s an affordable way to feed four people.) You can eyeball most of the ingredients if you’re making it for one, two, four or more people. But for the sake of ease, let’s assume we’re cooking for four right now. If you’re not using the entire bag of mussels, make sure you store them properly. Heat a big pot – perhaps one that is 6 or 8 quarts – and drop in a tablespoon of butter. Melt that baby and then add half a diced onion or some sliced scallions. After the onion gets a bit soft, add one or two diced cloves of garlic and move it around so that the onions and garlic don’t burn. Drop in a can of diced tomatoes and season with salt and herbs, if desired. By now your Brussels sprouts have about eight minutes left to get all brown and tasty, so now is a good time to add your mussels to the pot of warm, seasoned veggies. Add a good sprinkling of white wine or vermouth to the pot and simmer covered for about five minutes or until all mussels are open. Discard unopened mussels. Serve in bowls with Brussels sprouts in the dish or one the side, and remember to place an extra bowl on the table for the empty shells. If you’re looking for a new recipe you can also file under “healthy” and “inexpensive,” this is it. Incorporating more seafood at home increases variety, and challenges us to step out of our comfort zones with our meals. The same goes for kids. The more parents expand their own variety, the more likely kids try new foods. Look for kid friendly mussel recipes here. It’s typically advised to wait until the six-month mark to introduce seafood, as it is one of the top allergenic foods. Some recommendations state waiting until 12 months, so it’s always best to check with your pediatrician and consider your family’s allergy history. 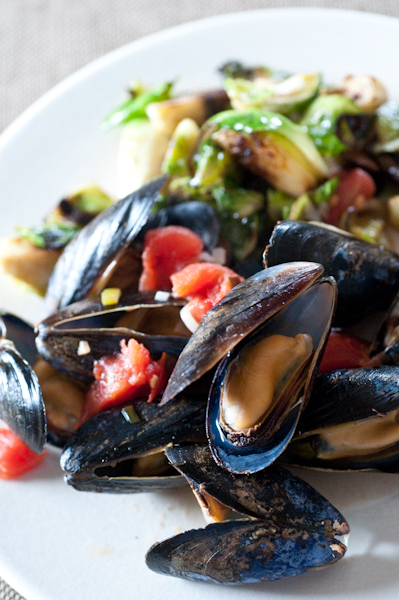 What’s your favorite recipe for mussels? This sounds like it tastes awesome. Thank you for sharing this one.